This characterful cottage is set down a private lane in the beautiful Stopham estate which has been in the same family since the Norman conquest.The cottage sits in its own 3/4 acre of mature, manicured gardens and has direct access to all the public footpaths of the estate. The cottage has recently been refurbished with a brand new kitchen, bathroom and wet room whilst retaining all of its character. It has central heating throughout as well as a log fire in the living room for colder evenings. One of the 3 bedrooms is downstairs with its own wet room, making it ideal for those with less mobility. There is parking for 6 cars and in the garden there is patio furniture as well as seating underneath the huge rhododendron bush, a large trampoline, orchard and barbecue. It is ideally located to visit the local area. Situated 10 minutes from Petworth, 20 minutes from Arundel Castle, 25 minutes from Goodwood and 1/2 hour from West Wittering and Bosham . The cottage has Sky TV, fibre optic broadband ,a printer and even an exercise bike! My wife grew up in the area. We now live in London but the whole family has enjoyed many years in Sussex. 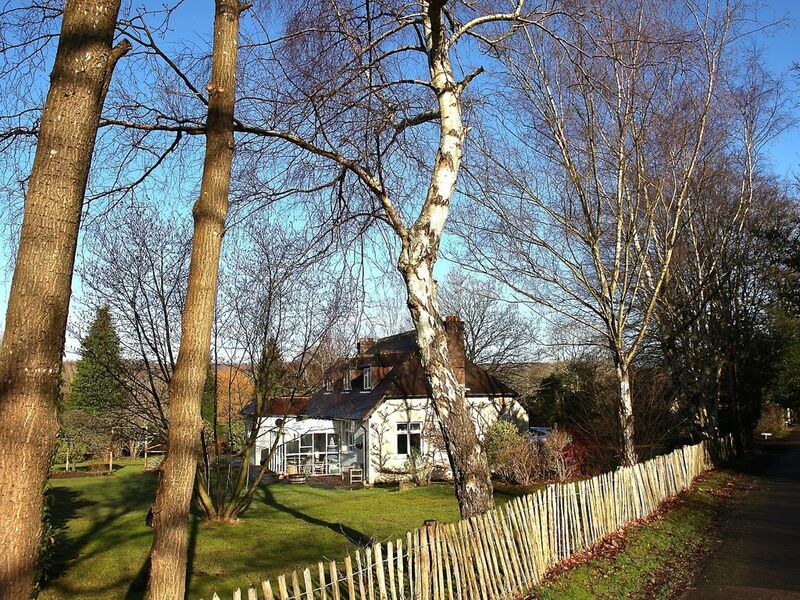 Being 5 minutes drive from Pulborough whilst situated in the quietest and prettiest location is a perfect combination. Also to have a garden of that size, coupled with the fact that there are no houses opposite gives one a sense of being in the middle of nowhere. We were lucky enough to spend a very relaxing few days over the New Year period in this lovely cottage in Fittleworth. Fabulous location close to woodland walks, Petworth house close by, plenty of family and dog-friendly pubs to choose from. The cottage is extremely well appointed and the garden is amazing, our 2 kids and dog enjoyed themselves thoroughly! Jeremy was very helpful and we would definitely recommend and stay again. A charming and well appointed house, quiet and secluded with beautiful garden. Perfect for a short relaxing stay or as a base to explore the South Downs. The perfect getaway home from home. Beautiful property in lovely surroundings. We were given plenty of information before arrival making it all much more relaxed. Absolutely everything was catered for and thought of. It literally felt like home and had everything we could possibly need. Perfect family home with a huge beautiful garden. Ideal for young and old. Lots of lovely touches. Thank you for a super holiday. We stayed 4 nights and Ashlyns is just perfect. Comfortable, spacious , well equipped. The owner gave us useful tips and information, and everything the advertising promises is delivered. The property is enough out of the way to be quiet and rural, but only a 10 minute walk to the village store and pub, and easy access to Pulborough, Petworth, Chichester. A great place to stay in a great location. Had a fab weekend away. Three generations including two young kids. Really well apppointed house with huge garden to enjoy. Great area for exploring the many lovely pubs and restaurants. Petworth House nearby. Can throughly recommend. The cottage is perfect for walkers being set in The South Downs National Park .. Chanctonbury Ring, Cissbury Ring, Seven Sisters and Beachy Head are some of the lovely walks . For bird watchers The Pulborough Nature Reserve is 10 minutes away . In the area there is angling, canoeing, hot air ballooning, horse riding, mountain biking and of course swimming and sailing on the south coast 30 minutes away. Fittleworth.. New community shop/cafe selling groceries, fruit, vegetables, local produce, fresh bread daily, newspapers, alcohol, local craft and even locally roasted coffee. 5 minutes walk. (open daily from 8.30am-5.30pm. 9-5 on Saturday and 9-12 on Sunday). Pulborough (village shops and RSPB Bird reserve): 5 minutes . Petworth House (National Trust House and 700 acre deer park designed by Capability Brown):10 minutes . Arundel Castle (built in the 11th century) : 20 minutes . See above for the brand new Fittleworth community shop/cafe...5 minutes walk.